Canadian Natural commenced steam injection at the Kirby South Phase 1 project in September 2013. 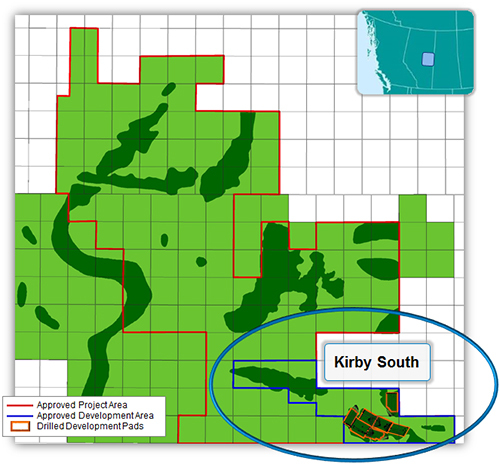 Kirby South operations are located approximately 85 km northeast of Lac La Biche. This is the first project that we have undertaken in the Athabasca Oil Sands area and in the McMurray reservoir and uses Steam Assisted Gravity Drainage (SAGD) technology for the recovery of bitumen from the in situ oil sands resources. The project includes a central processing facility for bitumen with a peak targeted production rate of 40,000 bbl/d of bitumen. The initial development with include 7 pads with 49 SAGD well pairs. Future drilling at Kirby South targets 4 infill producers and 2 set-out producer wells in 2018. Canadian Natural began construction of Kirby North, shortly after receiving regulatory approval in May 2014. Kirby North operations located in the McMurray reservoir and will employ SAGD technology for the recovery of bitumen. In the first quarter of 2015, the Kirby North project was deferred due to the fall in commodity prices. Most of the major equipment has been purchased and the Company’s technical teams having been continuously working to identify opportunities to lower the cost structure of the project. In 2016, the Company worked through the Kirby North construction process and its targeted drilling plans in order to ensure cost savings identified can be captured. 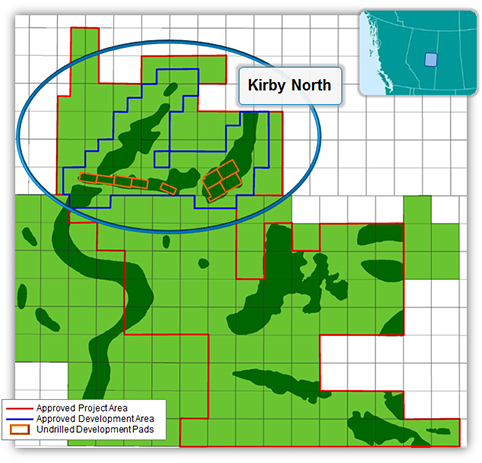 In late 2017, the Company reinitiated the Kirby North project with planned construction and well-pair drilling in 2018 and 2019, with targeted first oil in Q4 2019, one quarter earlier than originally planned. The project is targeted to include a central processing facility for bitumen with a peak production rate of 40,000 bbl/d of bitumen. The initial development plans for 2018 include drilling 49 producers and 44 injectors. The final drilling, targeted for 2019 will see 11 producers and 16 injectors drilled.